to the memo provided, this increase will take effect starting January 2, 2012 for new businesses (meaning new customers to comprehensive insurance) and effective March 2012 for the renewal businesses. So for the new customers who wants to change insurance companies or agents, better do it now until December 29,2012 to catch up with the current premiums. And for my existing customers that will expire up to March 31, 2012, please give me a GO signal to renew your policies immediately to get the current premiums! Insurance Commissions Letter-click to see in PDF. PIRA Cir.Rates on VTPL.PD cover.dec.05.2011-click to see in PDF. 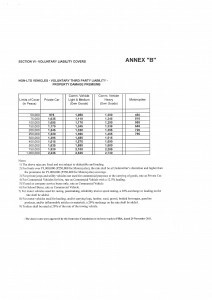 Complete TPPD Tariff– click to see in PDF.